Cairns Regional Gallery Hosts Fine Art Exhibitions, Preserves Unique Culture. The opening of the Cairns Regional Gallery was an exciting culmination of years of planning and fund-raising by the wider community of the Cairns district. Housed in the refurbished Public Office Building, the beautifully proportioned and graceful building took on a new lease of life in 1995, rapidly becoming a well-loved focus for tropical artists of the region. On-going programmes include broad ranging exhibitions from Australian artists, as well as a community exhibition programme for local groups and individuals, with a strong emphasis on Torres Strait and aboriginal artwork. Visiting lecturers and artists’ floor talks are part of a comprehensive education programme, which includes art classes for adults and children. Local artists are encouraged to exhibit in the Loft space at the top of the building, a small space which is suitable for solo and small group exhibitions. Usually an exhibition includes an artist's talk and sometimes workshops during the length of its display. Naturally, the focus of the gallery is strongly on artwork from the tropical north, particularly aboriginal art and that from the unique cultures of the Torres Strait islands bordering Papua New Guinea. The gallery's visual arts collection policy bears this out with significant representation from Aboriginal and Torres Strait communities, some of whose members are urbanised and live in the Cairns region. The gallery collection includes important work by Australian and international artists. 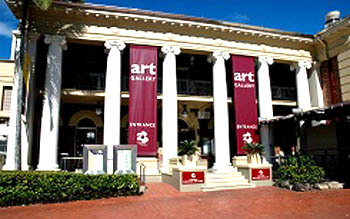 Cairns Regional Gallery has a well stocked shop where visitors may purchase production work, some from local artists as well as that from artists living in other Australian regions. An active Friends of the Gallery association assists with further fundraising and brings a sense of involvement to its members as well as providing practical benefits to them. Much may be learnt about a country from observing the culture of its people so a visit to the gallery is highly recommended to visitors. Enjoy!